Black and White and Loved All Over: Baby Bah Humbug? My eyebrow-arching, kissy-faced, seriously sassy toddler? She evidently turns into a personality-less blah baby when faced with Mr. Claus. 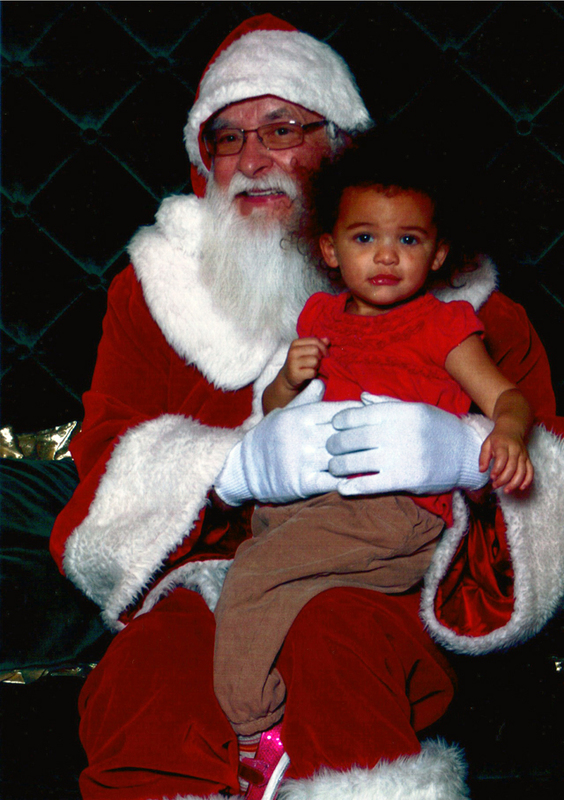 We took her to the Green Hills Mall to see the big guy on Friday night and she couldn't have been less impressed. She was way more excited to see her YaYa (my mom) who met us there than she was to see Santa. In the 30 seconds before this photo was taken there were tears literally popping out of her eyes, cartoon-style, because she wanted so badly to scramble back into my mom's arms. I just looked back at last year's picture of her in Santa's lap. What is happening here? Why is my gal growing so quickly? Also, just like last year, Santa Claus called Nekos over and told him that he looks just like Bo Diddley. I mean, SANTA SEEMED STARSTRUCK BY MY HUSBAND, kind of nervous and excited and longing for a minute of his time. Nekos was all like, "Yeah, dude, you told me that last year, too." And then Santa asked Nekos where he could find some good blues vinyl in Nashville. Hilarious. Nekos is obviously on Santa's nice list--again. Lucky. My friend made a small sign with her kid's name on it and as the walked by that Santa at Green Hills Mall she held the sign (unknowingly) over her daughter's head so Santa waved and said the kiddo's name- the girl LOVED it and was so excited! !